I can't upload sketches to my Arduino Uno. What steps can I take to work out what is wrong? I've got quite a few Arduinos, and over the last few years have only ever "bricked" one, and I think that was by zapping it with static electricity. Unfortunately that particular one had a SMD (surface mounted) processor chip, so it isn't easy to try swapping it with another chip. Power LED (green) - marked "On"
Note that the Rx and Tx LEDs are not connected directly to digital pins 0 and 1 on the board (marked Rx and Tx). They only illuminate if you are doing serial communications via USB, not if you have something (like a GPS) plugged directly into digital pins 0 and 1. Also note that since the "L" LED is connected via an op-amp, it may illuminate if pin 13 is set to an input in your sketch. This is normal. It doesn't mean that something is erroneously sending data. Plug the board into your computer with the USB cable and check that the green "On" LED lights up. Use a multimeter and a couple of jumper leads to test between the 5V pin and the GND pin (arrowed at the bottom). You should get a reading of around 5.0 V (I got 5.04 V on mine). 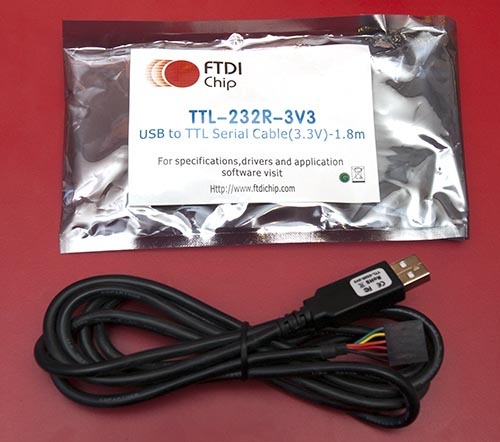 Also test between the 3.3 V pin and the GND pin - you should get 3.3 V.
If you do not get 5 V with the USB cable plugged in make sure the other end is connected to your computer. Also try a different cable. If you are using, or planning to use, the power jack (marked "power in" on the photo) disconnect the USB, and plug in a power supply - which should be 7 to 12 V DC with positive on the center pin. Measure the 5 V and 3.3 V pins as above. You should still see the same voltages on them. If you get 5 V with the USB connected, but not with the power supply then the voltage regulator (marked on the photo) is probably damaged. Or, possibly the power supply has failed. Try a different power supply to confirm which it is. If you have the Optiboot bootloader (the Uno normally ships with that) then if you press and release the Reset button, or unplug and plug the USB or power cable back in, the "L" LED should flash quickly 3 times. The "on" and "off" times are 50 ms each, the three flashes should be over within about 1/3 of a second. If it doesn't, you may have a problem with the bootloader, or the main processor chip (Atmega328P). Important: If you are having trouble uploading sketches remove any connected devices (like shields). Also remove jumper wires plugged into the board sockets. In particular, there should be nothing plugged into digital pins 0 and 1 (Rx and Tx) because that will interfere with communicating with the uploading computer. The "L" LED should flash 3 times. This is because the main chip is being reset by a command from the uploading process. The "Rx" LED should flash quickly. This is the instructions from the uploading process trying to activate the bootloader. The "Tx" LED should flash quickly. This is the processor acknowledging the uploaded data. You may see the above, even if the uploading process fails. This could be because the wrong board type is selected. If only the "Rx" LED flashes, it could be because of a problem with the bootloader, or the main processor chip (Atmega328P). Someone is knocking, but no-one is at home! If you have the wrong board type selected it will probably send the wrong uploading instructions, and time-out or otherwise fail. If you are like me and have different boards lying around it is easy to forget that the last upload you did was for a different board type. If the LEDs don't flash at all, you may have the wrong comm port selected. Try your Arduino on a different PC/Mac if you have one to hand. This can narrow down whether or not you have an issue with the particular computer you have plugged it into, or computers in general. Plug in the USB cable, and start up a terminal program - such as the Terminal Monitor in the Arduino IDE. Type something and send it (eg. hit Enter in the Terminal Monitor). Everything you type should be echoed back. If everything is echoed back: That confirms you have the right comm port, the USB cable is OK and the USB interface chip (Atmega16U2) is probably OK.
You have the correct comm port. Try a different cable. Some cheap USB cables only have power wires and not data wires. 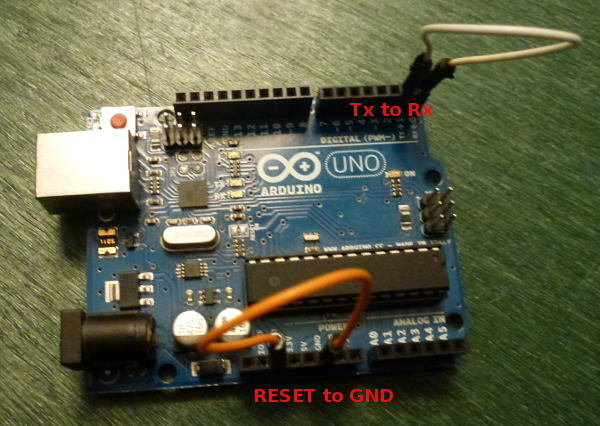 Check the device driver for the Arduino is installed. You probably don't need to do this if that board worked previously on this computer, but it can be worth doing if this is the first time you plugged this board into this computer. If your board fails the loop-back test, and you are certain the USB cable is OK, then you can test the Atmega16U2 chip itself. 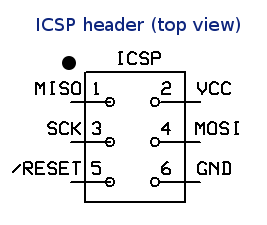 There is an ICSP (In Circuit Serial Programming) header on the board, adjacent to the Atmega16U2 chip, and near the USB socket. Disconnect the power first (unplug the USB cable and any power cable). Pin 1 on the ICSP header near the Atmega16U2 chip is marked with a small white dot, near the "F" in "AREF". Pin 1 on the ICSP header near the ATmega328P chip is marked with a small white dot, below the "N" in "ON". Then on the "known good" board install the "Atmega_Board_Detector" sketch as described on the Atmega bootloader programmer page. The code is at GitHub - nickgammon/arduino_sketches. If you click the Download button on that page you will get a number of useful sketches. The one you want is called "Atmega_Board_Detector". Compiled on Jul  9 2015 at 08:36:24 with Arduino IDE 10604. Flash memory size = 16384 bytes. "Failed to enter programming mode. Double-check wiring!" That would appear to indicate that your ATmega16U2 is not working. Pin 1 on the ICSP header near the ATmega328P chip is marked with a small white dot, below the "N" in "ON". The wiring is the same as before, except you are connecting to the other ICSP header - the one at the end of the board, furthest from the USB socket. Flash memory size = 32768 bytes. In this case it confirms that the main processor is working, and has the Optiboot bootloader on it. This isn't easy to replace, but it is only needed if you use the power jack. If you run from USB then it is not required. Alternatively you could arrange for a 4 to 5 V supply (eg. 3 x AA batteries) and connect them to the 5 V socket on the board directly. This is only required for uploading sketches via the USB port, and serial debugging. It isn't particularly easy to replace because it is a SMD (surface mounted device). However you can manage without it. You can upload sketches via the ICSP header, if you purchase a ICSP programming device. (Those photos were taken of a Ruggeduino, but the concept is the same). Now you can upload sketches directly to the main processor, bypassing the USB chip. You can also use my Atmega chip stand-alone programmer to upload .hex files - this lets you copy the .hex file for a sketch onto an SD card, and then program the board via the ICSP header. The main processor can be replaced fairly easily if it is mounted in a socket. Get a replacement chip from somewhere like Adafruit for around $US 6. Alternatively, try eBay. Try to get a chip which has the Optiboot bootloader already on it, to save hassle. Carefully prise the existing chip out of the socket, and install the new one, taking note of the location of pin 1. Pin 1 has a notch on the chip, and its correct orientation is noted on the first photo in this post with a yellow dot (closest to the edge of the board). You will probably need to straighten the legs slightly. Hold the chip by the ends and gently push down onto a flat surface, like a desk, until the are pushed inwards a bit. Try to not touch the metal pins, you may zap them with static electricity. I have a sketch at Atmega bootloader programmer which will replace the Optiboot bootloader. The wiring is the same as for the chip detector sketch. The code is at GitHub - nickgammon/arduino_sketches. If you click the Download button on that page you will get a number of useful sketches. The one you want is called "Atmega_Board_Programmer". 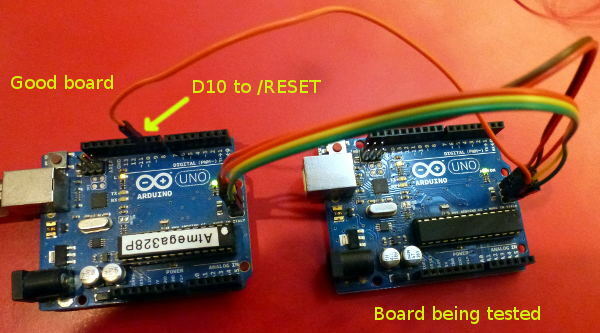 Install the sketch on your "known good" Uno, and connect it to the target board with the wiring shown earlier. Compiled on Jul  9 2015 at 15:06:58 with Arduino IDE 10604. Type "U" for the Uno (Optiboot) loader. Using Uno Optiboot 16 MHz loader. Bootloader length = 512 bytes. Type "G" to program the chip. This takes about one second. Now the bootloader is installed. The watchdog timer (off by default) can be configured to reset the processor after a certain time. The intention is to recover from a "hang" for a processor deployed in the field. However if the timer is set for a short period (like 16 ms) then the processor can reset again before the bootloader has a chance to do anything. The symptoms are that you cannot upload any new sketches. Some modern bootloaders (like Optiboot) take steps to stop this problem as one of the first things they do. However others do not. This can be difficult to recover from, because once the sketch runs, you have the problem of it resetting, and if you have the problem you can't replace the sketch. People often report that they have to burn a new bootloader to recover. However that is only because, as a side-effect, burning a bootloader erases the current sketch. Power off the board completely (remove the USB cable). Still holding down Reset, reconnect the USB cable. Once the IDE reports "Uploading" release the Reset button (or remove the jumper wire). It should now upload OK - as the sketch which activated the watchdog timer never started. I mention this here, even though this post is really targetting the Uno board, because it is quite common. Some versions of the Mega2560 bootloader look for "!!!" in the incoming upload from the PC, and if they see that, drop into debugging mode. This causes the upload to fail. Install a more recent bootloader. My "bootloader uploader" sketch mentioned earlier in this reply should install a bootloader that does not have that issue. Do not use "!!!" in your sketch. Problems uploading to the Leonardo / Micro / Esplora etc. 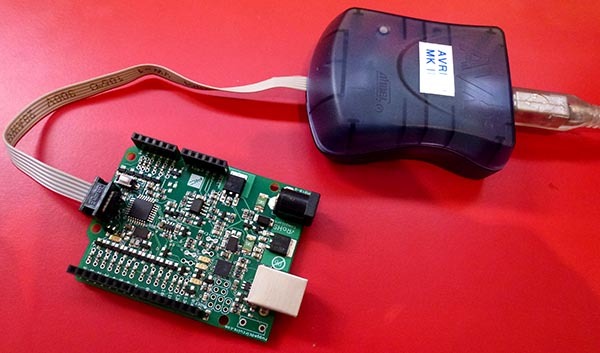 Boards with the ATmega32u4 as their main (and only) processor can be trickier to upload to. This is because the same chip has to handle uploads and also run your code. Compile your sketch without errors. As soon as the IDE reports "Uploading" press and release the Reset button. You only have a second or so to do this, before the old sketch starts running. Don't be discouraged if you have to repeat this process a couple of times. That is normal. At least - as I assume you upload your sketch via avrdude - please give more information about the upload failure (e.g. output of sketch uploader) so people here can help you better. Additionally to the great answer of Nick Gammon, please search for exclamation marks in your sketch. If your sketch contains a string with more than or equal to 3 exclamation marks, the upload will fail, as old versions of the Arduino Bootloader will interpret these exclamation marks as another function and the upload will stop. I have bricked 2x ATMega328P on my Arduino Uno board due to static (I think). The static seems to have killed the TX pin and hence the program can't be downloaded using the USB cable. The easiest solution is to replace the microcontroller. You can buy a new ATMega328P DIP programmed with the Arduino bootloader (such as this one from Adafruit) and you are ready to go again. Alternatively, you can still program the ATMega328P's by using the AVRISPmkII programmer. When you do, all but the Tx pin work fine. Not the answer you're looking for? 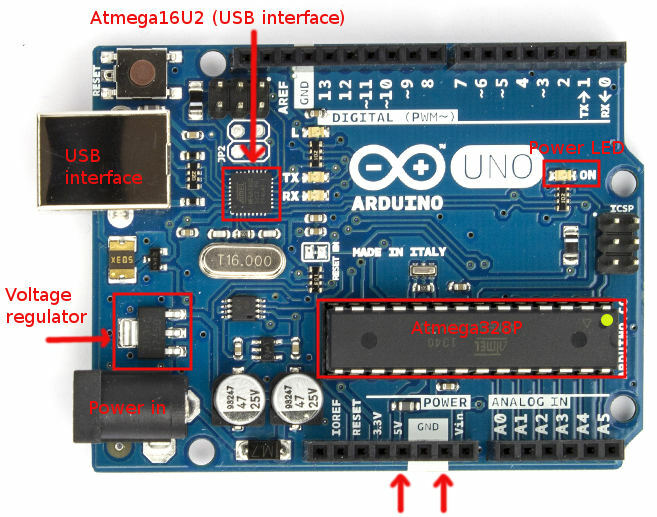 Browse other questions tagged arduino-uno uploading atmega328 icsp or ask your own question. How to check my Arduino board is working or dead?